Yale Hirsch has one of the longest-established investment newsletters in the country, as well as the famous Stock Trader’s Almanac annual. His name is synonymous with many well-known seasonality trends, and older investors recognize and respect his name. Yale brought his son, Jeff Hirsch, into his newsletter organization as publisher and editor in chief. Yet Jeff was not well known, and he had not yet had the stock-picking successes behind him that his father could claim. The challenge, then, was not only to generate subscriptions, but to also begin building Jeff’s reputation and expertise in the eyes of the investor audience. looks like a magazine, but is really a sales piece. Craig felt that a 20-page, 4-color printed piece on glossy stock with ample photos of both Yale and Jeff, many sidebars, strong headlines and direct response benefit-laden copy would create a powerful impact on the reader. Craig also recommended that Jeff stand beside Yale in a prominent photo on the cover, and that Jeff be shown in as many photos as Yale throughout the magalog. In the copy, Yale would be the author of the lead article, but he would refer to many of Jeff’s successful stock picks and investment strategies. Additionally, Jeff would author 4 to 5 sidebars in the magalog. 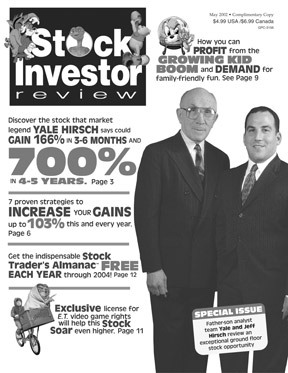 Because the Stock Trader’s Almanac annual was more well known than the newsletter Stock Investor Review, Craig decided to offer the annual as a gift incentive to subscribe. The annual was then featured in the center spread, with callouts on the many benefits. Also offered were four Bonus Reports and subscription savings. Visually, the magalog had an incredible impact, with many people commenting on how authoritative the Hirsches and their newsletter appeared. despite one of the worst markets since 1929. Over 1 million pieces were mailed.